Q: Tomorrow, British Prime Minister Theresa May will officially begin her visit to China. We noted that British Ambassador to China Barbara Woodward held a press briefing in which she said that the UK's commitment to the Golden Era relationship with China remained constant, steadfast and steady. The UK sees the immense potential of the Belt and Road Initiative and is a natural partner for it. The UK and China would maintain close cooperation in this regard. We know that the UK was the first to join the Asia Infrastructure Investment Bank as a major country in the West and an European country and it also has played an exemplary role in forging cooperation with China. Does China hope that the China-UK cooperation will continue to take the lead? A: At the invitation of Premier Li Keqiang, British Prime Minister Theresa May will pay an official visit to China and hold a new round of China-UK Prime Ministers' Annual Meeting from tomorrow to February 2. China attaches great importance to the China-UK relations and Prime Minister May's forthcoming official visit to China. We hope that Prime Minister May's visit will achieve positive results. I talked about this visit with you last week and yesterday. The current Sino-British relations are on good terms, facing new opportunities for development. We have noticed that Ambassador Barbara Woodward said to the media that Britain is a natural partner for China in advancing the Belt and Road Initiative, and the two sides will maintain close cooperation in this regard. Indeed, the Belt and Road Initiative (BRI) is an open and inclusive platform for cooperation, and it has been well accepted worldwide as the most important platform for international cooperation. The British government and Prime Minister May have voiced their support to the BRI on many occasions, and Chancellor of the Exchequer Philip Hammond attended the Belt and Road Forum in China last May as Special Envoy of the British Prime Minister. In fact, cooperation on the BRI is a major area where China and Britain can give full play to their respective advantages and achieve mutually beneficial and win-win results. The Chinese and British governments and market institutions all have the willingness to explore more opportunities for cooperation and expand broader prospects for development under the BRI framework. We believe that stronger pragmatic cooperation between the two sides under the BRI framework boasts immense cooperation potential and promising prospects. It will not only benefit the two countries and their peoples, but also help sustain the world economic recovery. At present, China and Britain are in close communication and coordination to make final preparations for the arrangements and outcomes of this visit. We believe that as China and the UK embrace the new era of development, Prime Minister May's visit will shift the China-UK "Golden Era" into a higher gear, and elevate China's cooperation with Europe and the West to a new level. Q: Reports say that according to the UN Security Council Resolution 2375, Chinese enterprises have left the DPRK in mid-January, just like DPRK enterprises have left China. Can you confirm that? A: As for details regarding the implementation of the Security Council resolutions, I am not very clear with each and every one of them. But I can tell you that China has been comprehensively and faithfully implementing the Security Council resolutions and fulfilling its international obligations. Q: Mr Chan Chun Sing, Minister in the Singaporean Prime Minister's Office, said in a recent interview that the top priority for ASEAN and China this year is to conclude the Regional Comprehensive Economic Partnership (RCEP) negotiation. He said Singapore has high aspirations for the RCEP and hopes that it could set high standards for the world's economic system. If anybody can do this well, said Mr Chan, China is one of them because it has a very strong central government that can redistribute the benefits to make sure they are more evenly spread out across different regions. What is your response? A: We have taken note of Mr Chan Chun Sing's remarks and we welcome these remarks. The RCEP negotiation is one of the most important free trade negotiations in the Asia-Pacific region. Once accomplished, it would lead to a free trade zone covering the greatest population with the most diverse membership and the greatest vitality. An early conclusion of the RCEP would boost confidence for the regional and global economic development and advance the building of the Asia-Pacific Free Trade Area. China attaches high importance to the RCEP negotiation. On the basis of fully respecting the ASEAN centrality, China stands ready to enhance communication and coordination with all parties including Singapore to implement the consensus reached at the first RCEP Leaders' Summit last November, bring the negotiation to a conclusion as early as possible, and contribute to the advancement of the regional economic integration. Q: The European Union today expressed concern about the case of Agnes Chow, whom the Hong Kong SAR has banned from standing for election. The EU said that this move risks diminishing Hong Kong's international reputation as a free and open society. What is your response to this? A: I just want to reiterate that Hong Kong affairs are China's domestic affairs, pure and simple. China firmly opposes any interference by foreign governments, institutions and individuals in Hong Kong's affairs. Q: On January 29, China's military aircraft entered into Japan's air defense identification zone (ADIZ). The Japanese side believes that this has cast a cloud over improving China-Japan relations and hopes to launch the China-Japan maritime and air liaison mechanism as soon as possible. What is your comment? A: I am not aware of the specific details, so I would refer you to the competent department. My understanding is that there should be no problem for the aircraft of one country, if it does not enter into another country's territorial airspace, to carry out normal flight in the relevant airspace in accordance with international law. 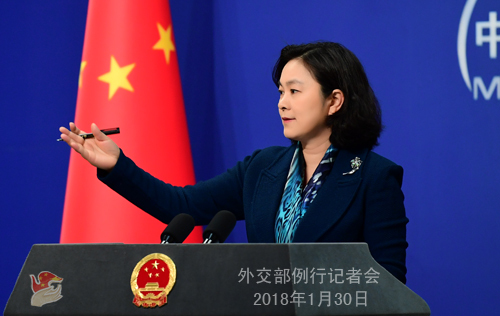 As for the China-Japan maritime and air liaison mechanism, as we said before, during Foreign Minister Taro Kono's visit to China, the two sides welcomed their principled agreement on establishing the maritime and air liaison mechanism, saying that they would like to sign and implement it at an early date. We hope that Japan could work with us and take concrete actions to enhance mutual trust, manage disputes, and maintain the momentum to keep improving China-Japan relations. Q: Do you have any comment on the allegations published in the French newspaper Le Monde at the end of last week that China had installed listening equipment at the Headquarters of the African Union building and had been monitoring it? A: The Chinese Ambassador to the AU has made a solemn response to the question you just raised. What was reported by Le Monde in this case is utterly groundless and ridiculous. The AU Headquarters was built with assistance from the Chinese government upon requests from the AU, as an important measure to promote African efforts of gaining strength through unity and advance African integration. After its construction, the AU Headquarters received universal and high appreciation from the AU and the African countries. The African people knows the best and is in the best position to say whether China-Africa cooperation is good or not. China will continue to uphold justice while pursuing shared benefits and follow the principle of sincerity, real results, affinity and good faith so that China-Africa cooperation will bear richer fruits. We never interfere in Africa's domestic affairs and never engage in any activity detrimental to Africa's interests. China-Africa cooperation will in no way be disrupted by the nonsense report of Le Monde. Q: The American Chamber of Commerce today issued a report saying most US companies are optimistic about China's economic growth, but many have complained about what they see as unfair treatment. How do you respond to this? A: As regards the American Chamber of Commerce and trade and investment issues, I would refer you to the competent authority, the Ministry of Commerce. Now that you mentioned this issue, I want to give you a principled response. I have noted that the report says that the US enterprises are more confident that China will open still wider to foreign investment in the coming few years. It also mentions that more US enterprises are increasing investment in China and they hold a positive attitude towards the improvement of China-US relations in the future. I think these observations are objective and consistent with the fact. Actually, after many years of development, China now has a 400-million-strong middle-income group, the largest around the world and still expanding at a fast speed as we speak. Such a group has generated a huge domestic market, providing opportunities and space for the development of enterprises from all countries, including the United States. I believe, any enterprise or entrepreneur with vision, good judgement and long-term strategy will not fail to realize that such a prospect, with its potentials still untapped, is bound to deliver tangible benefits. This year marks the 40th anniversary of China's reform and opening up. We have said many times that China's door to the outside world, once opened, will not be closed. Instead, it will open wider and wider. Attracting foreign investment is an important part of the reform and opening up, one of China's basic state policies. We will let the market play the decisive role in resources allocation, protect property rights, the intellectual property right in particular, encourage competition and oppose monopoly. We will continue with our efforts to promote an all-around opening up, substantially relax market access and expand the opening-up of the service sector, especially the financial industry. In a nutshell, we will, as we always do, welcome investment and operation of foreign enterprises in China and create a fairer, more transparent and more predictable investment and business environment for them. We hope that other countries can also provide a fair, equitable, transparent and predictable business environment for Chinese enterprises' investment and operation. Q: Today the Chinese side released the information that the King of the Netherlands will visit China. Could you brief us on the relevant arrangements for this visit? A: This morning, we issued the relevant information. At the invitation of President Xi Jinping, King Willem-Alexander of the Kingdom of the Netherlands will pay a working visit to China from February 7 to 8. During the visit, President Xi Jinping and Premier Li Keqiang will meet with King Willem-Alexander respectively. The leaders of the two countries will have an in-depth exchange of views on bilateral relations and issues of common interest. The Netherlands is an important cooperation partner of China in the European Union. Since 2014, the two heads of state have conducted historic mutual visits, which initiated the open and pragmatic partnership for comprehensive cooperation between the two countries. Now the China-Netherlands relations are marching forward with a strong momentum. Pragmatic cooperation in such areas as trade and investment, innovation, modern agriculture and water conservancy and cultural and people-to-people exchanges are making great headways, and bilateral cooperation under the Belt and Road framework is thriving. King Willem-Alexander is friendly to China and this is his second visit to China since he ascended the throne. We believe that this visit will further enhance political mutual trust, elevate bilateral cooperation in various fields and inject new impetus into the growth of China-Netherlands relations in the new era. Q: The Foreign Correspondents' Club of China just issued its annual report on the working conditions of foreign journalists in China, which found that the Chinese government has used the visa renewal process to pressure correspondents whose coverage it does not like and intensified attempts to deny or restrict access for foreign journalists to large parts of the country. I was wondering if you've seen this report and do you have any comment on that? And are there any steps China plans to take to improve the working conditions for foreign correspondents in China? 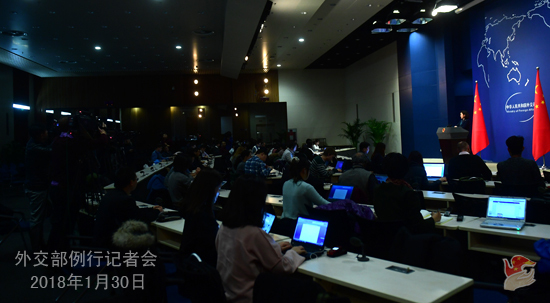 Then, you can tell the FCCC that foreign journalists present here today do not agree with its report's conclusion, so it has in no way reflected the genuine opinion of almost 600 foreign journalists stationed in China. We will continue with our efforts to assist and facilitate foreign journalists' report and coverage in China, as we always do. If you encounter any problem and difficulty in your work, feel free to contact us anytime. Q: Yesterday, Chris Patten, former British Governor of Hong Kong, had sent a letter to British Prime Minister Theresa May in which he expressed concern that Hong Kong is facing increasing threats to the basic freedoms, human rights and autonomy that its people were promised during the 1997 handover. He urged Prime Minister Theresa May to address this sort of concerns during her visit here. Does China have any comment on that? A: Since the return of Hong Kong, "one country, two systems", "Hong Kong people governing Hong Kong" and a high degree of autonomy have been effectively implemented. The Chinese government exercises overall jurisdiction over Hong Kong as mandated by China's Constitution and the Hong Kong Basic Law. Hong Kong is a special administrative region of China. Hong Kong affairs belong to China's internal affairs. 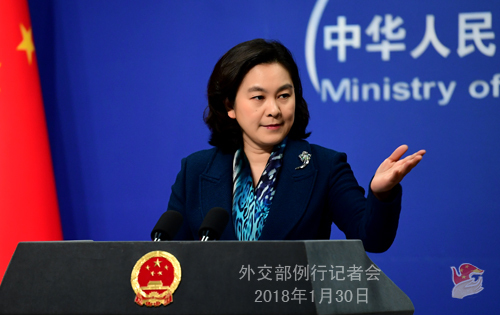 China firmly opposes the interference of any foreign government, institution and individual in the affairs of Hong Kong. This position cannot be clearer.